Positron Emission Tomography/Computed Tomography (PET/CT) performed in the staging and follow-up of patients with non-GI malignancies will occasionally detect a second primary tumor in the GI tract. The purpose of this study was to determine the ability of PET/CT to predict the presence of occult colorectal malignancy in patients already diagnosed with a non-GI cancer. A query of our IRB approved prospective Nuclear Medicine database was made and merged with a clinical chart review. All PET/CT were read by a board certified Nuclear Medicine Radiologist and all chart reviews were performed by trained clinicians. Between 1/1/2005 and 7/29/2008, 3259 PET/CT were performed on 1923 patients at our institution to evaluate non-GI malignancies. Of the 1923 patients, 40 (1.8%) had findings concerning for an additional colorectal malignancy. Invasive work up was not pursued in 27 patients (68%) secondary to either advanced disease or a plan of close clinical follow up. Colonoscopy was performed on 13 (32%) of these patients revealing: colorectal cancer in 3 (23%), benign adenoma in 6 (46%), no discernable lesions in 2 (15%), hyperplastic polyp in 1 (8%), and inflammatory reaction from chewing gum impacted in the cecum in 1 (8%). Of the 3 patients with a colorectal second primary, 2 patients were found to have disseminated disease upon further staging. The remaining patient had stage I disease and underwent a potentially curative resection. The median age of the patients undergoing colonoscopy was 68 years (range: 52-77) and 10 of these patients never had a prior colonoscopy. The positive predictive value of PET/CT to identify a second primary colorectal malignancy in patients with a non-GI primary cancer was 23%. PET/CT characteristics that correlated with benign and malignant findings were a median of 5.5 SUV (range: 4-12 SUV) and 15 SUV (range: 14-53 SUV) respectively. In our database, the positive predictive value of PET/CT scans concerning for colorectal cancer in patients with non-GI tract malignancies is low. It is known that PET/CT scans may be positive in both benign and malignant colorectal tumors and inflammatory lesions, confirmed in our study. 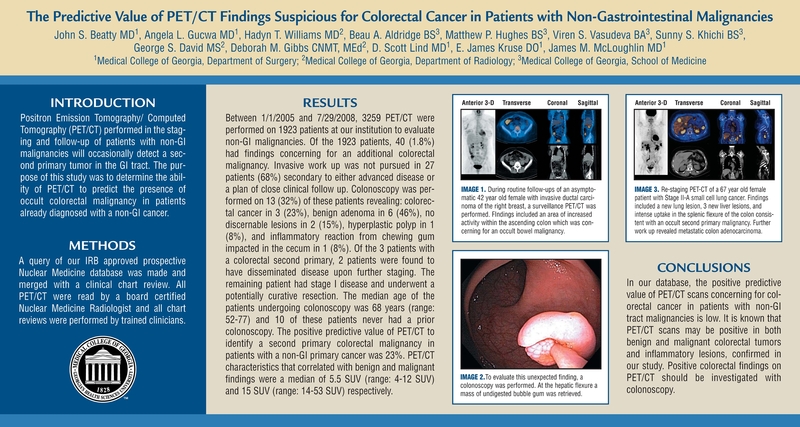 Positive colorectal findings on PET/CT should be investigated with colonoscopy.